Two Ingredient Banana Coconut Cookies. You guessed it! They have banana and coconut in them. I've seen a lot of "two ingredient" recipes (or three or whatever) that include "box of cake mix" or "can of soup" as one of the ingredients. Nope, not these. They have two real foods - Bananas and Coconut. That's it. Turns out they make a lovely cookie. 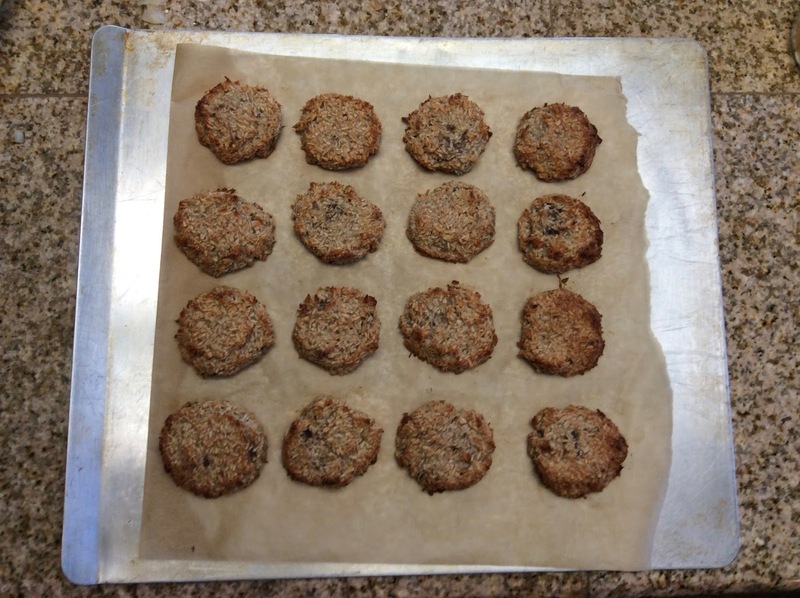 Gluten-free, grain-free, egg-free, nut-free, soy-free, vegan, "paleo," and more. 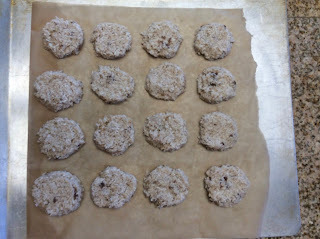 Unless you're avoiding coconut or bananas, you can eat these! In July we got a bunch of discount bananas from the not-so-perfect produce bin at a local market. The ones we didn't eat fresh, I chopped, bagged, and froze. In the summer and fall fresh produce is plentiful. In these cold dark days, pulling fruits and veggies out of the freezer, packed at their peak, is such a treat! Slightly overripe corn in August may be meh, but that same corn, pulled out of the freezer and added to soups or stews, is so scrumptious in February. We are now just about half way through our January No Spend Month. Digging through what's left in the freezer, I came across some frozen bananas from July. I pulled some shredded coconut out of the back of the cupboard. 1.) 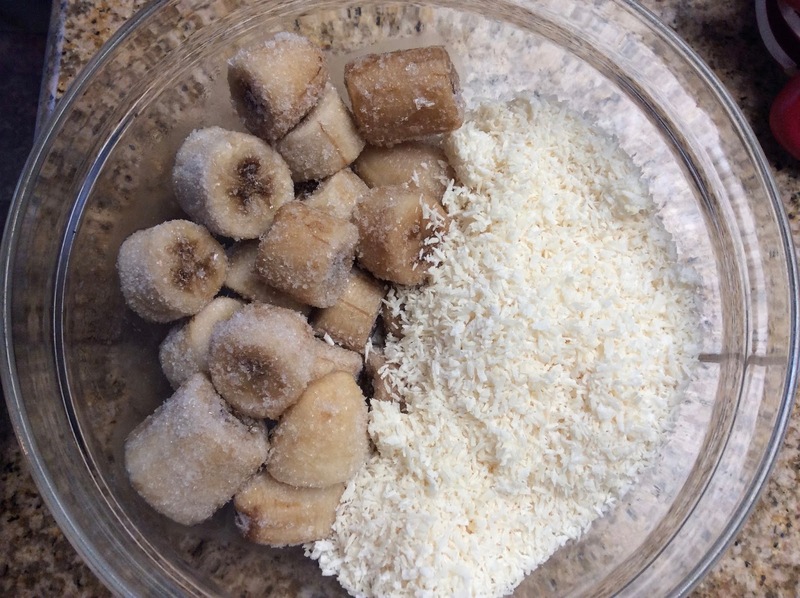 Smash equal parts bananas (thaw if frozen) and coconut together. Consistency should be on par with a stiff cookie dough. 2.) 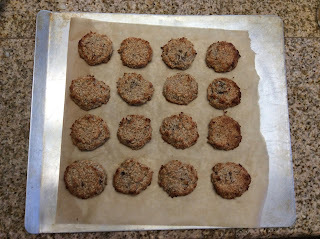 Form into discs on parchment or greased cookie sheet. 3.) Bake at 350f for 25 to 30 minutes (depending on size) or until golden brown. Enjoy with tea, peanut butter, dipped in chocolate, or any way you like!